By Laura - Bolivia - 29 Nov/02 - Viewed 1994 times. On our last morning in Sucre I got woken up by lots of loud singing. I thought it might be a wedding but it turned out to be a school graduation ceremony. I was glad to leave the miserable staff at the Residential Bolivia behind. Our bus collected us in the centre of town, saving us a taxi ride to the bus terminal. It only takes 3 hours to get to Potosi on a good paved road. Potosi is the highest city in the world at 4070m and it was very tiring walking around trying to find a hotel. Eventually we settled on La Turista Hotel and I managed to negotiate our first discount. It was still a bit expensive for us at B$80.00 but a lot better than some of the other places we saw. We went to organise our mine tour for the following morning. We decided to go with Amauta and paid B$75.40 each. Later on we went to an internet cafe (opposite the one which claims to be the world's highest internet cafe) which has USB ports (B$3.00 per hour). I found out that I had passed an exam that I took before I left. I had failed it twice already so I was relieved to find I will not have to take it again. Surprisingly the place closed at 7 and we had to leave. Before eating we stopped off at La Candeleria to exchange a book for B$3.00. We managed to find one good book although the selection there is not very good as with most book exchanges. I am not sure who would bring some of the books that they have. We ate at a restaurant on the main plaza, which serves pizza for B$7.00 a portion. As we had arranged we arrived at the Amauta office the next morning at 9 for our tour. Unfortunately they seemed to have forgotten we were coming and asked us if we would rather go in the afternoon. We declined as we had read that there were more explosions in the afternoon, so they hastily phoned up a taxi driver and a guide and we set off. At this point I still wasn't quite sure what was going on and we drove around for a while. I didn't realise the guide was already in the taxi and thought we might be going to collect him. After stopping at a couple of houses we dropped of one of the Amauta employees and then headed to the miners� market. This is where you buy gifts such as coca leaves and dynamite for the miners. At this point our guide introduced himself. While we were buying things our guide kept disappearing without telling us. I was already wishing we had chosen a different company for the tour. Fortunately our guide returned and we then went and collected our hard hats, jackets and wellies before heading to the mines. 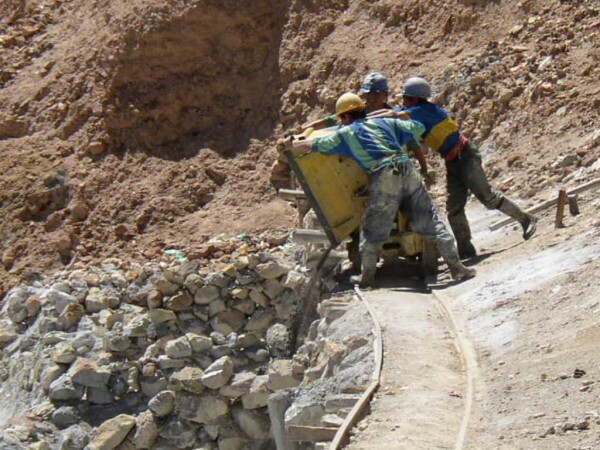 All the mines at Cerro Rico are run by by a small mining cooperative. They used to contain vast amounts of silver but now they mine for tin, zinc and lead. The miners work in groups of between 2 and 24 and earn between B$200.00 and B$600.00 a month, out of which they have to pay for their materials. We drove straight up to the top to the church and from there you can get a good view over Potosi. We then drove back down to the entrance of one of the mines. The guide went and sorted out our lamps before we walked into the mines. I had expected the mines to be very dusty but instead they were wet. After we had walked for 5 minutes we found a group of miners working. We explored the mines for about an hour. There is even a museum within the mines which gives details of the history of the mines. Over 8 million people have died over 300 years working in these mines, mostly Indian and African slaves. The Spanish would kill those who they thought were not working hard enough. Even today the conditions for the miners are very poor and they have a short life expectancy. When we walked back out of the mines the light was so bright that I could hardly see. At this point our guide asked us if we would like to see an explosion using the dynamite we had bought. We thought he would be doing something useful with it so we said yes. In fact, he was just a crazy pyromaniac. He set up the dynamite and got Mark to light it before sprinting about 100 metres away, leaving it and running back towards us. When he was half way back it exloded with a loud bang. I don't think any other tour group got this entertainment. We headed back to the Amauta office, stopping on the way to drop off our clothing. The traffic was congested and our taxi driver joined in with other drivers by beeping constantly even though the cars in front cannot go anywhere. We were back before 12 even though our tour was supposed to last 4 to 5 hours. I would definitely not use that travel agency again. We bought our bus tickets to Uyuni for the following day (B$25.00 each) and went for lunch at La Candeleria. They do vegetarian and normal set lunches for B$15.00 for four courses and also have an internet cafe. At 2pm we headed to the Casa de la Moneda. This was one of eight houses that used to print money for the Spanish. The coins were coded and if the Spanish found that the assayers had produced false coins then they were hung in the plaza. Nowadays Bolivian money, and that of many other Latin American countries, is produced in Europe. Apparently it is much cheaper that way due to the technology and security required. Afterwards we tried to get an extension on our tourist card but once again the immigration office proved to be elusive. We ate in the Cafe Kaypichu. This is exactly the same as the one is Sucre and is the first chain restaurant we have found in Bolivia. Today we got the bus from Potosi to Uyuni. We got a taxi to the bus terminal for B$6.00 but found out that there are at least two bus terminals and we were at the wrong one. A woman told us the office was 3 blocks up the hill so we walked for a while but couldn't find the office. We asked a man and he told us it was 3 blocks up a hill in another direction. I thought we might be on the receiving end of a Bolivian joke but we soon found the bus terminal. The bus journey took just under 6 hours with a stop for lunch. Mark asked a woman where the toilet was and she looked at him as though he was crazy and said "you go in the countryside". There was some good scenery on the way although the road was very bumpy.